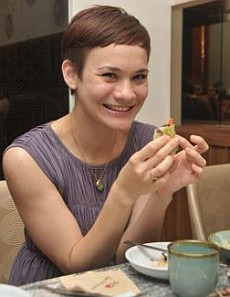 Popular actress and television host Aishah Sinclair gets acquainted with Korean cuisine and culture at Onsemiro. THE hand that rocks the cradle rules the world. In Aishah Sinclair’s case, her mum’s good cooking rules her palate, too. With her slender figure and elfin haircut, the pretty actress and television host looks every bit the yummy mummy. Motherhood certainly hasn’t stopped Aishah from yearning for her favourite dish – her mother’s apple crumble. Aishah, who is of English-Malay parentage, reveals that Western food has always been part and parcel of her life. Since Aishah isn’t familiar with Korean cuisine, Jay Park, general manager of Onsemiro helpfully shares some pertinent information about the restaurant and Korean food with her. Aishah Sinclair enjoying her first taste of Korean food. According to Park, the name Onsemiro means “a taste of nature” in the Korean language. At his urging, Aishah gamely sampled the ban chan selection: Sliced pickled radish, spring onion kim chi, white (cabbage) kim chi, spiced cabbage kim chi, fried fish, pumpkin and minced beef with vegetable pancakes, shredded red and green capsicum roll, and fresh mixed lettuce and onion salad. “I’ve never been a fussy eater even as a child,” says the doe-eyed lass. Amusing the taste buds: Ban chan or Korean appetisers to whet the appetite at Onsemiro. Naturally, Aishah was all ears when Park gave her some tips on how to enjoy the house speciality of yangnyeom-galbi – barbecued beef ribs with seasoned soy sauce. 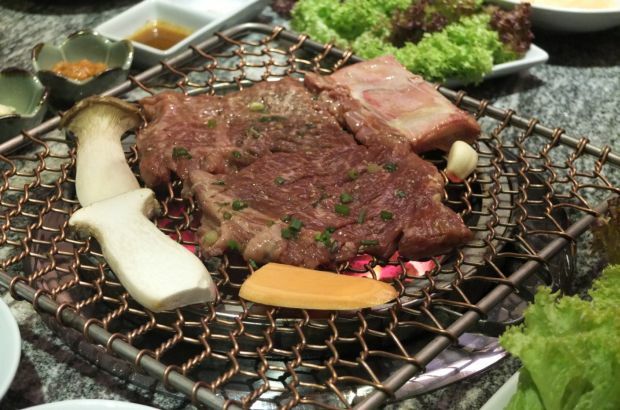 “The marinade has about 50 ingredients in it and we use specially imported oak tree charcoal for the grill to infuse the meat with a nice aroma,” says Park. 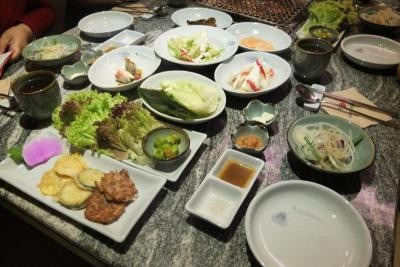 “In a typical Korean meal, this course is just an entrée before we proceed to rice or noodles. You should eat the beef on its own first to fully appreciate its meaty flavour before you try it with sea salt and ground black pepper, our special house sauce, doen jang (fermented red miso paste) and raw garlic slices. When I asked Aishah about the weirdest thing that she has ever eaten, she recalls being coerced by friends into eating goat’s brains at a nasi kandar place once. As the Onsemiro team plied us with steamed rice sprinkled with soo soo (African millet) and chilled thread-thin noodles with radish slices and hard-boiled egg in a tangy broth accompanied by side dishes of preserved cuttlefish and more pickles, the host of ntv7’s The Breakfast Show hinted that she will appear in a new, upcoming travel programme that showcases interesting holiday hot spots throughout Malaysia. Besides spending time with her 18-month-old daughter, Aishah is determined to continue championing worthy causes with her Celepets gang. “CLPT which stands for ‘celebrities with pet projects’ initially started out as a lark between Daphne Iking and myself. Our friends: Atilia Haron, Sazzy Falak, Dynas Moktar, Yasmin Hani and Serena Choong then joined us; to support each other’s pet projects and also selected charitable causes. Ultimately, our aim is to do good and help others,” says Aishah at the close of our lunch interview.